Volker Schlöndorff’s adaptation of Gunter Grass’s novel ‘The Tin Drum’ is almost unbearable. It turns the rise of Nazism into a grotesque farce and suggests those involved were mentally aberrant rather than willing participants in the horror. That the film offers such a childish view of the world should not be a surprise given we see the world through the eyes of little Oskar (David Bennent). Oskar is three years old and decides to stop growing when he receives a tin drum for his birthday. As a citizen of Danzig, the ‘free city’ claimed by Poland and Germany he is at the heart of the chaos that will engulf the world. In the novel the narrator is unreliable and probably insane. Schlöndorff makes Oskar a heroic figure performing his own mini-rebellion against an ideology which promotes physical strength. As an allegory it does not work because Oskar’s decision not to engage with the adult world makes him as guilty as they are. Schlöndorff takes the magical realist elements of the novel literally and despite his regular collaborator Igor Luthor using the kind of bright garish colours you associate with a Hollywood musical The Tin Drum never has the otherwordly fairytale feel you suspect Schlöndorff was aiming for. Yet The Tin Drum is undeniably an important film. When the film premiered in 1979 West Germany was undergoing an identity crisis with the younger generation seeking to confront their parents over their involvement with Nazi Germany. Schlöndorff was part of a movement critics christened the New German Cinema though none of the directors had much stylistically in common with each other than being from the same country and challenging the old order. Gunter Grass too challenged the complacency of the FDR with his irreverent and often provocative novels. The film became an international hit managing to be one of the few films to pick up the Palme D’Or at Cannes and an Academy Award for Best Foreign Picture. Arrow Academy continues their impressive series of classic European films with this dual format DVD release of The Tin Drum. Both the original theatrical cut and restored version of the Director’s Cut are here. Schlöndorff provides an audio commentary and there two interviews with him, the first given at Cannes in 2001, and the second concerning the new version. Where Arrow Academy often excels is in the written work accompanying a film. 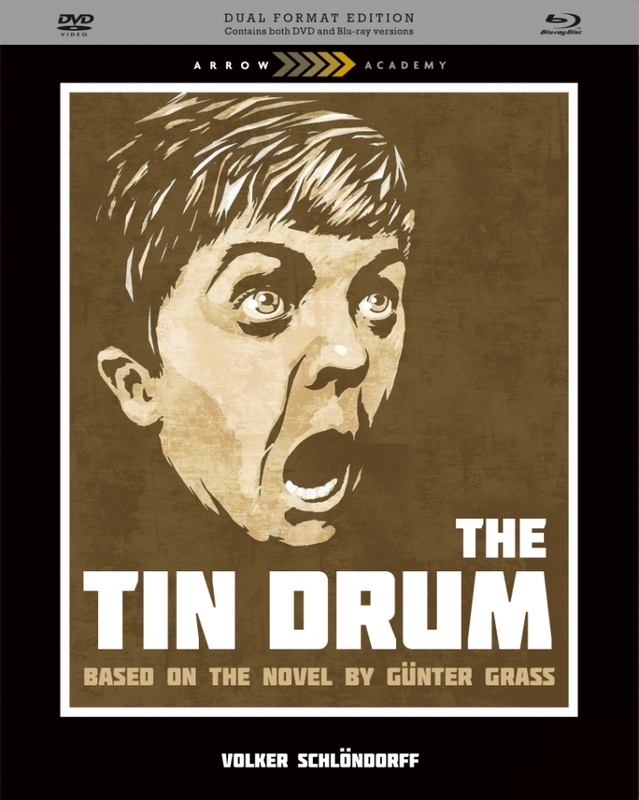 The Tin Drum has essays by George Lellis and Hans-Bernard Moeller, authors of ‘Volker Schlöndorff’s Cinema: Adaptation, Politics and the Movie-appropriate,’ as well as extracts from the director’s diary, and pieces by screenwriter Jean-Claude Carriere, and Gunter Grass.